As long as you take the time to properly train your dog and give it the attention it requires, you can definitely get it to do its business indoors. This skill may come in handy come winter time when the snow outside makes it next to impossible for you to walk your dog around the block. A good way to make that happen is to first invest in an indoor dog potty, an item designed to act like a dog counterpart to litter boxes for cats. That said, let us point out that not all dog potties are created equal and that some are definitely better than others. 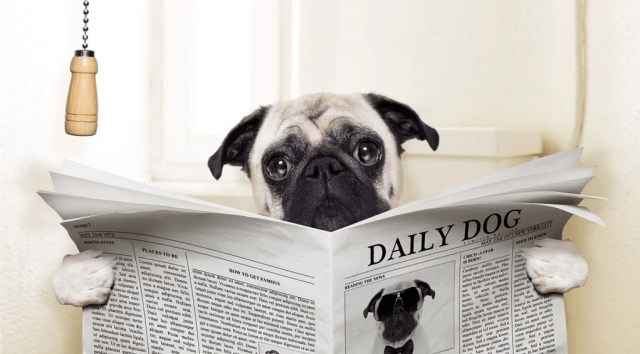 After taking everything into consideration, let us take a look at the ten best indoor dog potties money can buy. 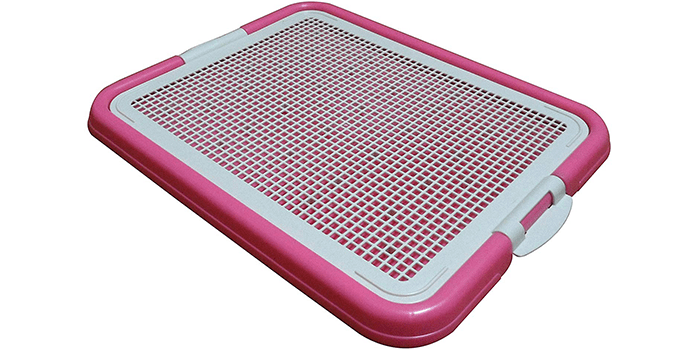 Quite impressive in size by most standards, the Pet Time Dog Toilet Pet Dog Cat Indoor mesh Potty is a premium grade litter tray that helps train your pet from an early age. Made with durable mesh that aims to keep urine away from your pet’s paws, it comes with a heavy-duty rubberized base that keeps the training pad from sliding or moving around. Convenient to use, sturdy and resistant to damage, this indoor dog potty is easy to clean and maintain. Ideal for small apartments and indoor use, the Potty Patch Dog Litter Box is the best solution for all your dog’s potty training issues. 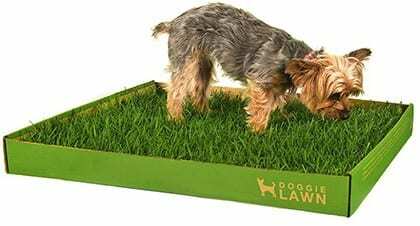 Made with high-quality materials that are durable and resistant to outer damage, it features grass that automatically attracts your pet, allowing them to utilize the box whenever they need to relieve themselves. Designed to prevent unpleasant odors and stains, this potty training box is easy to clean and just requires a quick rinse with soap and water. Ideal both for indoor and outdoor use, the Synturfmats Pet Potty Patch Training Pad for Dogs measures 20x30x1.25 inches in size and is designed specifically for large breeds. Including a triple layer system, it features a plastic, grid tray that allows the liquid to drain through, keeping your dog’s paws dry, along with a base tray that holds the liquid. 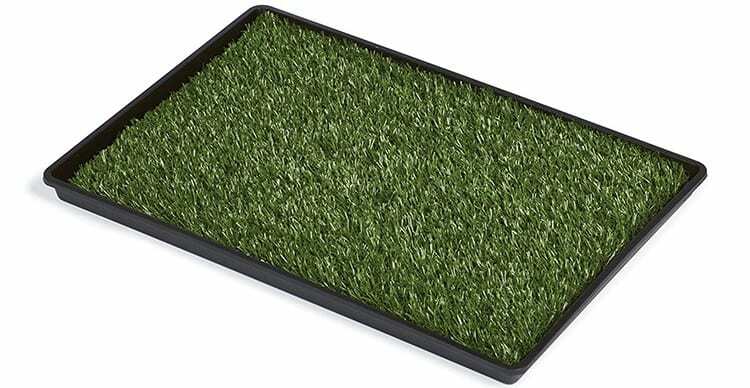 Made with eco-friendly, premium grade materials, it is crafted with a PP base tray and PE synthetic grass that looks similar to real grass and is entirely non-toxic. Similar to grass, the Sonnyridge Dog Potty Training pad is a heavy-duty synthetic surface that is designed to help your dog potty train faster. Crafted for those pets who are not able to go out often, this potty training system features anti-microbial grass that is treated with elements to help in the prevention of odor and bacterial growth. Equipped with a triple layering including an outer layer which is the grass, porous middle layer and a base which is a tray that is ultra-durable and resistant to leaks and holds the urine. Made with premium quality materials, it is easy to wash and can be rinsed clean with soap and water. The Petzoom Dog Relief System is a 3 piece potty training pad that is designed to help dogs potty train indoors. Made with high-quality materials and safe to use, it does not contain any toxic elements of chemicals that are harmful to pets. 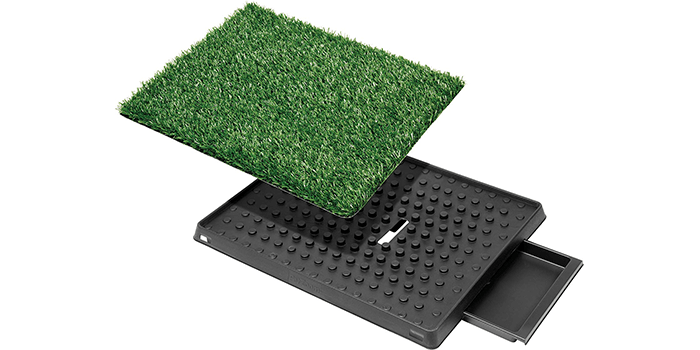 Featuring synthetic grass, an insert and a base tray which can be detached for quick and easy cleaning, this potty pad is ideal for porches, balconies, and patios. 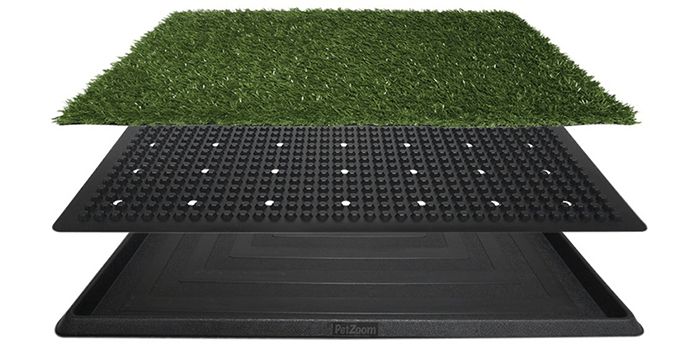 Light in weight, portable and convenient, the Prevue Hendryx Tinkle Turf is a premium grade potty training pad that features soft, real-like turf made from synthetic material. Lead-free, non-toxic and safe for your pets, this pad helps control odor and prevents bacterial growth. Impressive in size, it is ideal for potty training your pet at home or while traveling. Great for similar sized dogs that include bulldogs, Siberian Huskies, boxers, golden retrievers, Labradors and more, it comes in three sizes, small, medium and large. Known for its premium quality and durability, the PetZoom Pet Park Indoor Pet Potty features a robust synthetic grassy surface that is almost real. Equipped with 3 layers, the mat is toxic-free and is designed to control unpleasant odors while keeping your home clean and bacteria free. Great for indoor use, including balconies, patios, and porches, this portable dog potty training system is ideal for housebreaking your dog. Ideal for dog owners who do not have the time to take their dogs outdoors for potty training, the PETMAKER Indoor Potty Trainer is a high-quality bathroom mat that helps your dog relieve themselves indoors. 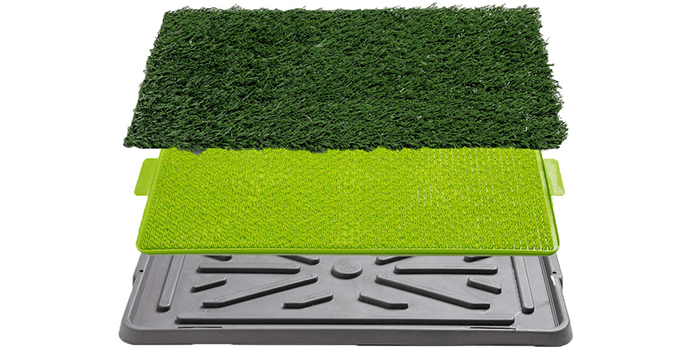 Featuring 3 layers including a grass mat, a tray, and an insert, it is resistant to odor and is antimicrobial. Cleaning the mat is easy and can be done by rinsing out each layer with soap and water. 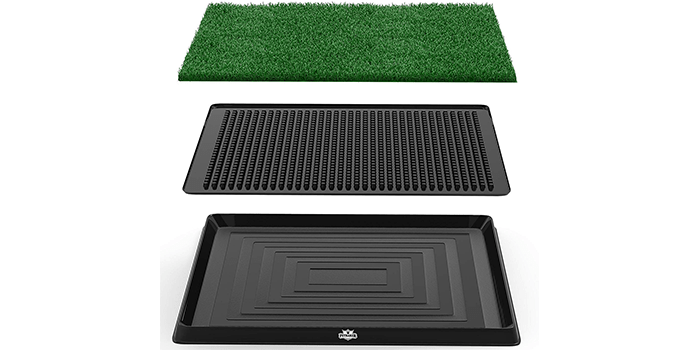 Not just that but this mat also ensures your dog’s paws stay dry while all the liquid flows through into the durable base tray. Reasonably large and accommodating, the DoggieLawn Large Disposable Dog Potty is 25% bigger than other potty training mats of its kind. Thanks to the real grass implemented in this design, it helps in neutralizing unpleasant odors. Designed for apartments, patios, and balconies, this potty training system works great for pet owners who do not have the time to take their pets outdoors. Easy to use and extremely convenient, this dog potty can be used and thrown away after a few weeks and replaced with a new one for a budget-friendly price. This premium quality disposable dog potty from Fresh patch is a popular product that is well known for its real hydroponically-grown grass. With the ability to neutralize unpleasant odors and prevent bacterial growth, this potty training pad attracts dogs automatically, making potty training easy for the owner and dog alike. Ideal for puppies, older dogs, and for those who do not have quick access to the great outdoors, this potty training system works great by most metrics.